Australian researcher, Dr Stephen Munro from Australian National University and a team from Leiden University in the Netherlands have found evidences of our ancestors being artistic much earlier than we thought. Zig-zag drawings on a shell found by Dr. Munro provides proof of not only art skills in very early Homo Erectus, but also their very existence far earlier than what we have ever documented before. In fact, some reports are suggesting that these recent findings could very well re-write our understanding of the species and our knowledge of when this species actually existed. The shell drawing is at least 300,000 years older than other art markings thought to be the oldest made by humans or Neanderthals. Homo erectus, which means “upright man” in Latin, is an extinct species of hominin that lived throughout most of the Pleistocene. The Pleistocene is the time period ranging from 1,640,000 to 10,000 years ago. This time period is marked by great fluctuations in temperature that led to the ice ages. During this time period several forms of human went into extinction. These homo erectus were the early forerunners to modern day humans and they lived during this epoch. This particular species was believed to originate in Africa. 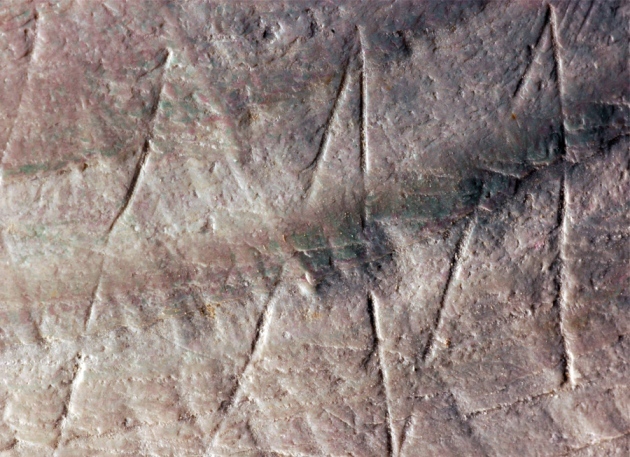 The pattern, drawn by a homo erectus as long as 540,000 years ago and found by the Australian researcher, could change all understandings of our early ancestors.The pattern looks like previous finds, but the oldest known of those dates from 100,000 years ago. “This is the first time we have found evidence for Homo erectus behaving this way,” he said. The drawings were in zig zag patterns on shells. Interestingly, the primitive species Homo erectus, had opened the shells by drilling through them with a shark’s tooth. The age of the art shell evidence, and the location it was discovered, discount earlier theories that these engravings had done by later ancestors, Neanderthals, or by human beings. It seems as if our ancestors were artistic and alive much earlier than we had once pegged them to be. This was truly a fascinated find. To read more about the findings, see it published in Nature journal.